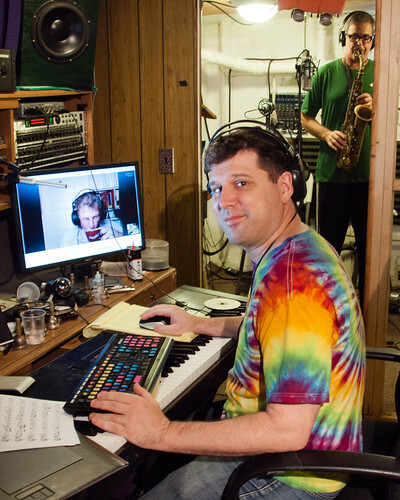 Skyping-in on the recording session. With a spot of tea. Skyping-in on the recording session. With a spot of tea., a photo by NewYorkBrass on Flickr. Erin took this really snazzy (lets bring that word back) picture of Ron Bertolet blowing his selmer sax while Paul Bennet is sipping. Paul was the bassist of the 1970s English band MAZARIBA which disbanded in the late ’70s and has recently reunited and are working on releasing their reunion album. Although these days Paul lives on Long Island, NY, I hear drinking tea on whilst listening with studio headphones on Skype is a British passtime. Incidentally the saxophone is a rare “Low E” model alto which has a deeper tone due to it’s extra length. Most saxophones have two low note keys, this one has three.